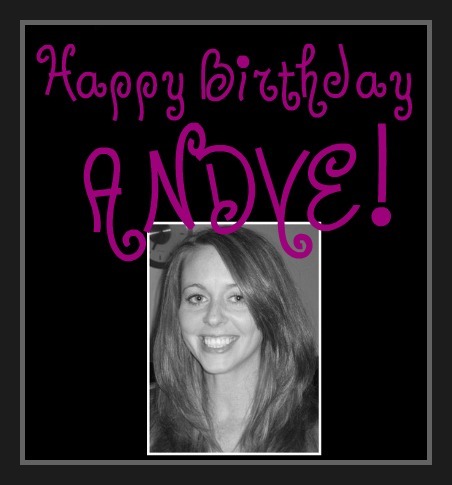 Google+ Reading Teen: HAPPY BIRTHDAY ANDYE!!! You have been a great friend to me. You have helped me come out of my shell more than anyone I know. You have helped me grow in ways only people know me best could explain. I hope we continue to be the best of friends for a long, long time. Andye, I love you and I want to wish you a very HAPPY BIRTHDAY! Happy Birthday Andye!!! Lucky you-> there are a TON of great books who are celebrating their birthdays today too (City of Fallen Angels, Huntress, Red Glove, Where She Went...). Hope it's full of yummy cupcakes and great books!!! How about when she sticks her foot out so you trip then kicks you while you're down? You know it's because she's only 23, don't you? Happy Birthday Andye!!! Coincidence- It's my birthday too!!! Happy Birthday Andye! Celebrate YOU today!!! Just got home from Charlotte! Happy Birthday, Andye! Kisses from NC! As a side-note I got an awesome box in the mail today. Thanks!